Designs by Helly: Blog Train Freebie + Store Opening + NEW STUFF!!! Blog Train Freebie + Store Opening + NEW STUFF!!! Well, you all know from a previous post that I was getting a bit bored(ok, alot bored) with retirement. I was missing designing soooo much! So I decided to email Kim at the Digichick to see if she possibly had room for a lil wayward chickie, and she said yes! So I am back with my friends at TDC with a whole new sense of purpose and lots of ideas! NSD is this weekend, and of course we are having a sale over at TDC. AND, I have two brand new, sparkling kits in the store! The first one is called Sincerity...in my usual shabby romantic, kinda vintage style(and of course, with my favorite color). 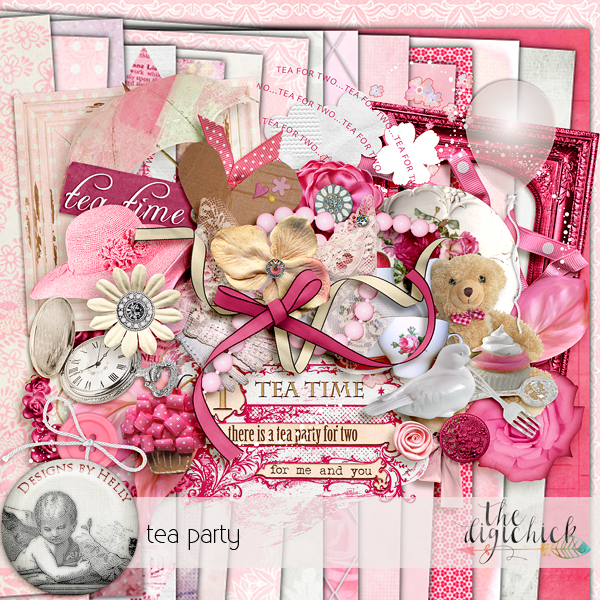 And the next one is called Tea Party, just because I felt like doing something uber girly!! My whole store, including new releases, is 50% off through next Wednesday! I also have alot of commercial use at super duper low prices for you designers! AND, the Chick Blitz category is open, with lots of pretties for only $2! You can grab my mini HERE. Click below to go to your next stop! So glad to have you back designing again and at TDC! Thanks for the darling mini. And did you hear my shout of joy??? How wonderful you are coming back to the chick! And thanks for the mini! Thank you! This is really lovely. It is great to have you back! So happy you are back. Thank you for your gift. Thank you, love that silver frame and the cameo. Thank You very much for your contribution in the blog hop ! Is this the first stop, I have followed the hop from here to the end, but haven't seen a full list so I and there is no Previous button, so I don't know if I have it all? Thank you so much for your Memory Keeper mini. Love your cameo -- reminds me of my mother and her love for cameos. Yay!!!! You're back!!!! I'm so happy to see you back designing and at TDC! Thank you for your part of the TDC NSD blog hop kit. Happy you're back! Thanks for the beautiful mini. Welcome back!!! & thanks so much for your portion of this beautiful collab! I love the sparkly scatter! SO happy to see you designing again, Helly! Thanks for this gorgeous mini. Lovely. Thank you very much for sharing. Visit Designs by Helly's profile on Pinterest. Header from L'amour Au Printemps by Designs by Helly. Awesome Inc. theme. Powered by Blogger.